This afternoon's session was brilliantly orchestrated. Combining George Osborne and James Dyson with the Education team gave the subject of education real gravity and relevance. In the past, the purpose of education seems to have been ignored. But today Michael Gove and others made it clear that the education system needs to provide people with skills that enable the wider economy to prosper. 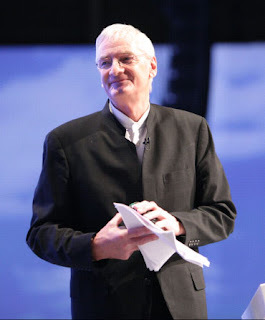 An outstanding speech from James Dyson. He started by exploding the myth that our economy can survive on service industries, banking and other financial services. He then tore up Labour's lawn by stating simply that we cannot prosper in this country without making things, (or at the very least designing them), and that we need to focus on inspiring and educating more engineers and scientists. Dyson quoted some shocking stats. He explained that Patent applications (per head of population) are a leading indicator of prosperity - the more patent apps' the more Intellectual Property (IP) will be created by any economy - makes sense. The UK is way, way behind. The Japanese file 19 times more applications than we do. The Americans 13 times more and the Chinese 9 times (per head of population! - So the Chinese file more than 175 times more than the UK do!!!). Basically it's simple. We need to invent stuff and then sell it to other people. But currently we don't have the inventors. Last year there were 58,000 engineering vacancies in the UK and 20,000 qualified applicants..